Note: You must be a logged-in member to be able to see clubs in levels below level 1 on the maps. Addition of Bonaire level 1. Addition of Kosovo level 1 and Gibraltar level 1. We just added ABA (basketball) to extend our basketball coverage even more, and USFL (American football) to extend our American football coverage even more. Let us know what you think. We just added CFL (American football) and XFL (American football) to extend our American football coverage even more. Let us know what you think. We just added NFL (American football) for our next sports coverage. Let us know what you think. We just added ECHL (ice hockey) as another ice hockey league (3rd tier, under NHL). Let us know what you think. We just added MLB (baseball) for our next sports coverage. Let us know what you think. We just added AHL (ice hockey) as another ice hockey league (2nd tier, under NHL). Let us know what you think. We just added NBA (basketball) for our next sports coverage. Let us know what you think. Yup, we're still here! No news to share other than Happy New Year 2015. We continue to keep countries updated as best we can. We just aren't noting it each time here like we used to...mostly cuz we're getting lazy I guess. If you want to join our team, we'd love to have you. We just added NHL (ice hockey) as a proof of concept. It's an old season, but it is just meant to show how it looks. We think it's pretty neat. Let us know what you think. We have recently added seasons 1991-1992 through 2004-2005 in England, bringing our coverage to 21 seasons for England. Our coverage of England now includes every Premier League season since its inception in 1992-1993, along with the prior season (1991-1992), which was the final season of the old historic football league structure. We have added an enhancement to designate the clubs which win their respective leagues each season. As shown below, you can select the league winner in the newly added dropdown menu in the upper-left gray rectangle on the main country map of each country. Clicking on a line will send you to that club's location on the corresponding map. Arrow #1 points out the logo which designates the club as the league winner. 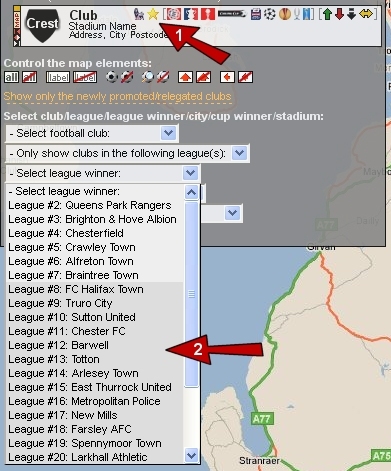 Arrow #2 points out that while many league winners may be shown, if the background is gray that represents lower leagues which are not mapped for that country, so clicking those entries does not send you to the club's location on the map (because they aren't mapped). It will take us some time to document all league winners in every country and season. If the menu isn't there for a country/season, it means we haven't yet set any league winners. Also, for situations like in USA in MLS, each season the MLS Cup designates the league winner, which we already track, therefore we don't redundantly track that league winner using this new feature. Note also that in some countries for their lower leagues we aren't breaking out their league structure into exact leagues, rather we are tracking them as levels, in an attempt to keep our sanity. So in these cases we can't show the league winners. Addition of Pakistan level 1, Syria level 1, and Yemen level 1. We have added World Cup 2002, 2006, and 2014 coverage, along with a main World Cup page, with plans to add all past World Cups. Addition of Tajikistan level 1. We have modified all usernames so they are in lowercase. Along with this, usernames are no longer case-sensitive when you log into the website. We have done this so our login process is more standardized. Addition of Bahrain level 1, Bhutan level 1, Cambodia level 1, Guam level 1, Iraq level 1, Jordan level 1, Kyrgyzstan level 1, Myanmar level 1, Nepal level 1, Taiwan level 1, and Turkmenistan level 1. We are thrilled to annouce that Soccer Explorers is now part of Footiemap.com. Soccer Explorers has brought to the footballing community football from every corner of the globe, offering a comprehensive and much acclaimed World Soccer Atlas. Our linking up allows us to have complete coverage of global football, with both a website as well as book. They can browse most of the web site and see every country, but only the clubs in the top league of each country. They are presented with banner ads throughout the web site. or seasons being worked on by Footiemap Supporters, but not "live" or "active" yet on the web site). Their membership is FREE and will not expire, and it is NOT a trial membership as before. They have the option to upgrade their account to the level of a Premier member. They can browse most of the web site and see every club and league in every country which are documented on the web site. They cannot see BETA enhancements. They can set their favorite and/or hated clubs in their profile, but they do not see them elsewhere on the web site. Their membership fee is US$5 and it comes up for renewal each year. on the web site) and see every club and league in every country which are documented on the web site. They are NOT presented with banner ads anywhere on the web site, thus removing that annoyance as well as speeding up their viewing. They can see BETA enhancements. They can set their favorite and/or hated clubs in their profile and be able to see them elsewhere on the web site. All new signups will be given Standard memberships. For all existing members, you do not need to do anything. For members who have trial memberships, we will migrate your accounts to be Standard members. For members who have paid for membership, we will migrate your accounts to be Premier members. We will also email all previous members, notifying them about this very significant membership change, so they don't miss out on a free lifetime membership. Please continue to support this web site. With this change in our membership scheme, we need your help to keep the web site free. You can contribute in many ways. We need more Footiemap Supporters to help maintain all of the countries we now cover. Please let us know if you have an interest and some time for this. Also, you can contribute simply by clicking on banner ads to visit our advertisers. As always, thank you for your brilliant support. Please bear with us as we make these changes to the system. For the first time, starting with season 2010-2011, we now have full coverage of all England (Men) clubs in Levels 1-9. This is an amazing 651 clubs! Certainly the level of detail diminishes the further down the pyramid you go, but you can help us out with this by providing valuable feedback. We would love to enhance our coverage of England non-league clubs and possibly even look at mapping them. If you are a brave soul and would like to take on this challenge, please let us know. You will earn a free lifetime membership for this work. We have redesigned the main homepage which shows the maps of the confederations. Now you can easily toggle between them simply by moving your mouse over top of each confederation logo. Addition of Angola level 1, Benin level 1, Botswana level 1, Burkina Faso level 1, Burundi level 1, Cape Verde level 1, Central African Republic level 1, Chad level 1, Comoros level 1, C�te d'Ivoire level 1, Democratic Republic of the Congo level 1, Djibouti level 1, Equatorial Guinea level 1, Eritrea level 1, Ethiopia level 1, Gabon level 1, Guinea level 1, Guinea-Bissau level 1, Lesotho level 1, Liberia level 1, Libya level 1, Madagascar level 1, Malawi level 1, Mali level 1, Mauritania level 1, Mauritius level 1, Mayotte level 1, Mozambique level 1, Namibia level 1, Niger level 1, Republic of the Congo level 1, R�union level 1, Rwanda level 1, S�o Tom� and Pr�ncipe level 1, Senegal level 1, Seychelles level 1, Sierra Leone level 1, Somalia level 1, Sudan level 1, Swaziland level 1, Tanzania level 1, The Gambia level 1, Togo level 1, Uganda level 1, Zambia level 1, Zanzibar level 1, and Zimbabwe level 1, rounding out our fifth complete coverage of an entire confederation, CAF. Addition of Macedonia level 2. Addition of country links for Liechtenstein. We've covered Liechtenstein clubs since the addition of Switzerland, but to show completeness in our UEFA coverage we've added Liechtenstein as a separate country. Addition of American Samoa level 1, Cook Islands level 1, Fiji level 1, French Polynesia (Tahiti) level 1, Kiribati level 1, Micronesia level 1, New Caledonia level 1, Niue level 1, Palau level 1, Papua New Guinea level 1, Samoa level 1, Soloman Islands level 1, Tokelau level 1, Tonga level 1, Tuvalu level 1, Vanuatu level 1, and Wallis & Futuna level 1, rounding out our fourth complete coverage of an entire confederation, OFC. Addition of Anguilla level 1, Bahamas level 1, British Virgin Islands level 1, Dominican Republic level 1, Grenada level 1, Guadeloupe level 1, Montserrat level 1, Netherlands Antilles level 1, Saint Kitts and Nevis level 1, Saint Lucia level 1, Saint Vincent and the Grenadines level 1, Saint-Martin level 1, Sint Maarten level 1, and Turks and Caicos Islands level 1, rounding out our third complete coverage of an entire confederation, CONCACAF. Addition of Nigeria level 1. What happened to all of the England and Scotland Premier League and Football League club crests? Due to licensing concerns, we have had to remove them from our web site (we are showing the below crest image in their place). If you wish to get your favorite (or hated!) club's crest back on this web site, please help us by contacting the clubs/leagues and gaining their permission to show them on Footiemap.com. We have better organized the country menu of the top menu bar for Men. Previously in the country menu, all countries were shown without any categorization. Now, the country menu (again, this is only for Men) organizes countries by confederation. Mouseover the flag in the top menu bar and notice that you can now simply mouseover confederations to select them, and then their corresponding countries are shown for you to click on. Addition of Antigua and Barbuda level 1, Aruba level 1, Barbados level 1, Bermuda level 1, Cayman Islands level 1, Cuba level 1, Dominica level 1, Haiti level 1, Martinique level 1, and United States Virgin Islands level 1. Addition of Belgium level 4. Addition of Guyana level 1, Nicaragua level 1, and Suriname level 1. Addition of Mongolia level 1. We have added an enhancement which gives you even more options to view clubs from different leagues on the maps. Previously, you could view all documented clubs in all leagues or view clubs by individual league or level, but now in addition to these, you have the ability to view clubs from different combinations of levels. For example, for England men, you can now additionally view clubs in the following levels: Levels 1-2, Levels 1-3, Levels 1-4 (the traditional Football League: "The 92"), Levels 1-5, Levels 2-3, Levels 2-4, Levels 2-5, Levels 2-6, Levels 3-4, Levels 3-5, Levels 3-6, Levels 4-5, Levels 4-6, Levels 5-6. You can see the additional options in the "Only show clubs in the following league(s)" dropdown menu in the upper-left gray rectangle on the main country map of every country that has at least 3 levels. Note that in order to see and take advantage of this you must be a logged-in member. Addition of Belgium level 3. Addition of French Guiana levels 1-2. We are adding World Cup coverage, with plans to also cover past World Cups. 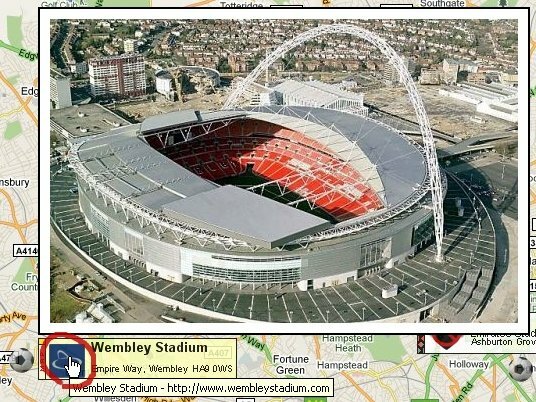 Stadium venues are mapped, with fixtures to be added as well. Notice the extreme left-hand section, which has the Photolog colored square in the top left (in the case of this club, it is red meaning it has no Photolog entries), then a "MAP" link below it. Notice the changes to the extreme left-hand section. The Photolog color square and "MAP" link are smaller, allowing for "controls" at the bottom. The top red control with the vertical bar and leftarrow allows you to jump backwards to the earliest documented season for the selected club, the middle controls (red leftarrow and white rightarrow) allow you to go back one season or forward one season, respectively, and the bottom white control with the vertical bar and rightarrow allows you to jump forward to the most recent documented season for the selected club. If any controls are gray, that means they are not clickable (for instance, if you are currently sitting on a map of the earliest documented season for the country, you cannot go backwards to earlier seasons; therefore the top and middle leftarrow controls will be gray). To see and try out these new controls, click here and navigate around the site. Please try out the new controls and let us know what you think. Addition of Japan (Women) levels 1-2. Addition of Norway (Women) level 1, Sweden (Women) level 1, and Germany (Women) level 1. Addition of our third coverage of Women's football, USA (Women) level 1. No, this isn't April Fools. We have slightly revised the structure of the web site, splitting our coverage of Men and Women football. All prior functionality remains, it's just that they are split in the country menu of the top menu bar. In the country menu, you will now see either a "Switch to Men" or "Switch to Women" link, which allows you to toggle between the two. Addition of San Marino level 1, rounding out our second complete coverage of an entire confederation, UEFA. Addition of Bolivia level 1, rounding out our first complete coverage of an entire confederation, CONMEBOL. We're honored to have just been reviewed by When Saturday Comes, earning web site of the month for March 2009! (Oh, contrary to what the review says, we cover many many leagues and you can see them all by signing up). We have just added complete coverage of a defunct league, the NASL in USA, including its predecessor leagues of USA and NPSL (you must be a logged-in member to see NPSL). We have just added our first coverage of a defunct league, the NASL in USA. We have created a Footiemap Facebook group. Join in the discussions about this web site. We plan to upload videos, screenshots, etc. Addition of our second coverage of Women's football, Australia (Women) level 1. Addition of Azerbaijan level 1. We have added a much more detailed main country map of Argentina, along with Argentina level 3. Addition of Cameroon level 1, and our 100th country! To commemorate this milestone, we have added our first coverage of Women's football, England (Women) levels 1-2. Addition of Puerto Rico levels 1-2. Addition of Bangladesh level 1. We have added a new feature called Campaigns, where members can earn free extensions to their memberships. There has never been a better time to sign up on Footiemap.com. We have added a new feature called Defunct Clubs, where we track clubs which have folded. They are also included in your Search results. Addition of Lebanon level 1. Addition of Jamaica level 1. Addition of Andorra level 1. We have implemented registrations on the site. Please read our F.A.Q. to learn about this significant change. Addition of Kazakhstan level 1, Montenegro level 1, Thailand level 1, and Uzbekistan level 1. Addition of Kuwait level 1. Addition of Armenia level 1, Paraguay levels 1-2, Peru level 1, and Saudi Arabia level 1. Addition of Belarus level 1, Bosnia and Herzegovina level 1, Georgia level 1, Iceland levels 1-2, Macedonia level 1, Malta level 1, and Moldova level 1. Addition of Kenya level 1. Addition of Ghana level 1. Addition of Qatar level 1. Addition of Albania level 1, Bulgaria level 1, and Serbia levels 1-2. Addition of Vietnam level 1. Addition of Iran level 1. We have added a new feature called SeasonCompare, where you can compare the differences between two seasons in countries. This is initially in BETA, so we welcome your feedback. Addition of Argentina levels 1-2. Addition of Scotland level 5 (Highland Football League). We have added much more detailed main country maps of England and Scotland. Addition of Indonesia level 1. Addition of Egypt level 1. Addition of India level 1 and Uruguay level 1. Addition of Hong Kong level 1, Malaysia level 1, and Singapore level 1. Addition of USA level 3 (USL 2). Addition of Ecuador level 1, New Zealand level 1, and Venezuela level 1. Addition of Colombia levels 1-2. Addition of Belize level 1, Canada level 1, Costa Rica level 1, El Salvador level 1, Guatemala level 1, Honduras level 1, and Panama level 1. Addition of Chile levels 1-2. Addition of Cyprus level 1, Israel levels 1-2, South Korea level 1, and United Arab Emirates level 1. Addition of Algeria level 1. Addition of Slovakia levels 1-2. Addition of Luxembourg level 1. Addition of Romania level 1. Addition of Estonia level 1 and Latvia level 1. Addition of Morocco level 1. Addition of Faroe Islands level 1. Addition of Mexico level 1. Addition of Tunisia level 1. Addition of Ukraine level 1. Addition of China levels 1-2 and Lithuania level 1. Addition of Slovenia levels 1-2. Addition of Japan levels 1-3. We have added a Footiemap Supporters recognition page to the site. Our team is varied and passionate about football. Come join the fun. We have added a new feature to the site, a zoom level setting to the menu bar on the main country map pages. This feature has been added in an effort to help you gain perspective, especially on the larger country maps. Give it a try on one of our larger country maps. It's in BETA form at the moment, so give it a spin and let us know what you think. Addition of Hungary level 1. Addition of Croatia levels 1-2 and Trinidad and Tobago level 1. Addition of Greece levels 1-2. Addition of Russia levels 1-2 and Turkey levels 1-2. Addition of Germany levels 1-3. Addition of Wales level 1. Addition of Denmark levels 1-3, Netherlands levels 1-2, and Belgium level 2. Addition of Spain level 3. Multiple-season support added to the site. This is a massive enhancement, and you can now select the season you wish to view from the season dropdown box on the main map page, the all clubs page, and the search page. Addition of Spain levels 1-2. Enhanced search page, where you can now search any or all countries at once. Addition of South Africa level 1. Addition of Poland levels 1-3 and Brasil national level 1. Addition of USA levels 1-2. Addition of Norway levels 1-3. Addition of Sweden levels 1-4. Addition of Australia level 1 and Finland levels 1-3. Addition of Belgium level 1. Addition of Austria levels 1-2, Czech Republic levels 1-2, and Northern Ireland level 3. Addition of Northern Ireland level 2. We have added a new feature to the site, a small map of Europe, which is displayed if you visit our homepage without passing in a country. On the map, you may mouseover and click on the country you wish to view. Addition of Switzerland levels 1-3. Addition of Portugal levels 1-3 and France level 4. Addition of France levels 1-3. Addition of Northern Ireland level 1. Also, we have added a new sliding dropdown menu listing the countries mapped. To activate this, move your mouse over the "Map:" or flag in the upper left corner of the menu bar. Then, click on the country whose map you'd like to look at. Addition of Ireland levels 1-2. We have added a new feature which we are calling "photolog", where you may upload your own personal comments/memories of clubs/stadiums you have seen, as well as photographs. To access this, click on the red/yellow/green square in the extreme upper-left corner of the club labels, or the links which get displayed on the Search and All Clubs pages. Addition of Italy levels 1-4 (Serie A to Serie C2 Girone C). We want to share some exciting news with everyone who visits us. As you are likely aware, our maps of England and Scotland have been great successes. Based on continued positive feedback for us to branch out to other countries, groundwork is currently being made to add several more countries. Countries we plan to add in the near future are Italy, Brasil, Wales, Ireland, Northern Ireland, France, Germany, Netherlands, Portugal, and Spain. Note that in order to accomplish this, we have enlisted the assistance of "Footiemap Supporters". This is a new term we will use to show our appreciation to passionate fans who take on the task of adding new countries and maintaining the information. Do you want to be a Footiemap Supporter? Let us know. Addition of Scotland levels 1-4. This site goes live, with England levels 1-6 mapped, and levels 1-9+ documented.